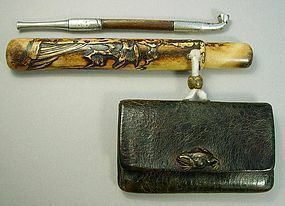 A Japanese leather tobacco pouch with pipe case (kiseruzutsu) and ojime made out of stag horn. The pipe case is finely carved in relief with an eagle on a pine branch above a waterfall; the ojime is engraved and decorated with a key fret design; the pouch with a patinated copper clasp modeled as a frog. All and all, it feel muscular (large) and detailed with quality. Pipe sold separately (Listed, item # 1036417). Meiji period (1868 - 1912). To search by the item numbers, just enter the numbers in search box - located at the top right corner of our catalogue page).